Nier: Automata, Platinum Games' action-packed robot drama, is getting a Game of the Year edition, according to the ESRB. Nier: Automata Game of the Yorha Edition recently appeared in the organization's official ratings board, which is sound evidence of an impending release, though Platinum Games has not officially announced anything at the time of this writing. Nier: Automata originally released in February 2017, and it received a Game of the Year-esque revamp on Xbox One earlier this year with the release of its Become As Gods Edition. This special edition came with the game's only major DLC - confusingly titled 3C3C1D119440927 - which includes new arena challenges that award extra outfits for protagonists 2B, 9S, and A2. The challenges themselves are difficult and delightfully silly, with some featuring boss fights with Square Enix president Yosuke Matsuda and Platinum Games president Kenichi Sato. Yes, really. The previously released Become As Gods Edition also packed in a medley of miscellaneous skins and accessories, and Nier: Automata hasn't seen any major add-ons since. So, what's in the Game of the Yorha Edition? I mean, it will presumably come with everything in the Become As Gods Edition and then some, so what's new? Maybe some Soul Calibur 6 crossover trappings, or some new cosmetics or subquests? If nothing else, I hope Platinum throws in some performance improvements, especially for the PC version. 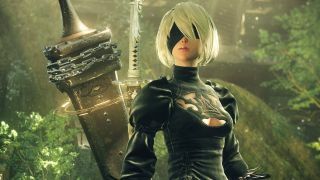 As our sister site PC Gamer reported, Nier: Automata's PC port ran horribly at launch and, while it was eventually fixed by modders, it has been pretty thoroughly neglected by Square Enix. With a new fancy edition on the way, you might want to hold off on buying Nier: Automata, but there are tons of other great Black Friday game deals going on right now.